David will be on stage during the weekend chatting with cartoonist and fellow animator Steve McGarry about his amazing career – and there are some other special events planned. Which include playing the tuba! David began an earnest interest in animation and cartooning at age 9, and making super 8 movies, drawing, and tuba playing eventually led him to the UCLA Animation Workshop. After a variety of freelance art jobs David became an animator on The Tracy Ullman Show in 1987. There he, along with fellow animators Wes Acher and Bill Kopp, began animating and developing The Simpsons with Matt Groening. In 1989 The Simpsons was made into a primetime series, and David became a director, and later supervising director and a producer. His credits include The Road To El Dorado, co-director on Monsters, Inc. in 1998 and, of course, the Simpsons Movie in 2007. The longest-running animated show in the world, The Simpsons has spawned a hit line of comics, published in the US by Bongo and under licence in the UK by Titan Comics. “Comics and animation have always has a lot of crossover,” notes Festival Director Julie Tait. “We’ve often featured guests who’ve worked in both media, including Luke and Steve McGarry, to name but two. 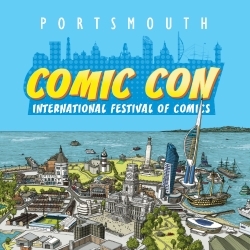 Guests announced so far for this year’s Festival weekend are Steven Appleby, Yomi Ayeni, Sayra Begum, Elizabeth Breitweiser, Corey Brotherson, Stanley Chow, Guy Delisle, Alan Grant, Ottilie Hainsworth, Rian Hughes, Kripa Joshi, Joe Kelly, Ian Kennedy, Kaisa Leka, Victoria Lomasko, Steve McGarry, Graeme McNee, Mikiko, Emmi Nieminen, Ken Niimura, Ian Rankin, Orijit Sen, Seth and John Wagner.